Australia has joined other jurisdictions including Canada and New Zealand in requiring two people to be in the cockpit of regular public transport (RPT) flights at all times. Deputy Prime Minister and Minister for Infrastructure and Regional Development Warren Truss told reporters in Melbourne on Monday Australia’s airlines would immediately implement the two-person rule for all RPT services operated by aircraft with 50 or more seats. “Today’s decision is a sensible, measured response that combines safeguarding the travelling public with the practical capabilities of the aviation sector,” Truss said in a statement. “The pilot in command of the aircraft will retain operational discretion on the application of the two flightcrew cockpit requirements, to ensure safe operations, depending on flightcrew circumstances. Transport Canada and the NZ Civil Aviation Authority brought in a two-person cockpit rule following revelations the copilot of Germanwings flight 4U 9525, Andreas Lubitz, locked the captain out of the flightdeck and took control of the Airbus A320 that crashed into the French Alps killing all 150 people on board. Several airlines round the world, including Norwegian Air Shuttle, Lufthansa, Air Berlin, Easyjet, Monarch Airlines, Virgin Atlantic and Thomas Cook, were also changing their operating procedures to require two people to be in the cockpit at all times. Qantas said on Monday the new rule would apply across its Qantas, Jetstar and Network Aviation fleet. The only exception was for flights operated by its 18 Dash Q200 and Q300 turboprops, which have fewer than 50 seats and generally flew short sectors of between one and two hours “where the need for pilots to leave the cockpit is minimal”. “Together with regulators and other airlines, Qantas will closely study any learnings that stem from the Germanwings tragedy to help make aviation even safer,” Qantas said in a statement. Virgin Australia also confirmed it would be policy at the airline for at least two crew members to be in the cockpit at all times, following a detailed risk review and consultation with the Civil Aviation Safety Authority and the federal government. “Safety is our number one priority, and the Virgin Australia Group continuously undertakes thorough risk reviews to maintain the highest safety and security standards,” Virgin said in a statement. Regional Express (Rex) chief operating officer Neville Howell welcomed government’s move, adding that it was already the airline’s policy. “However, we believe this requirement should not be restricted to an aircraft with a seating capacity of 50 and above,” Howell said in a statement. 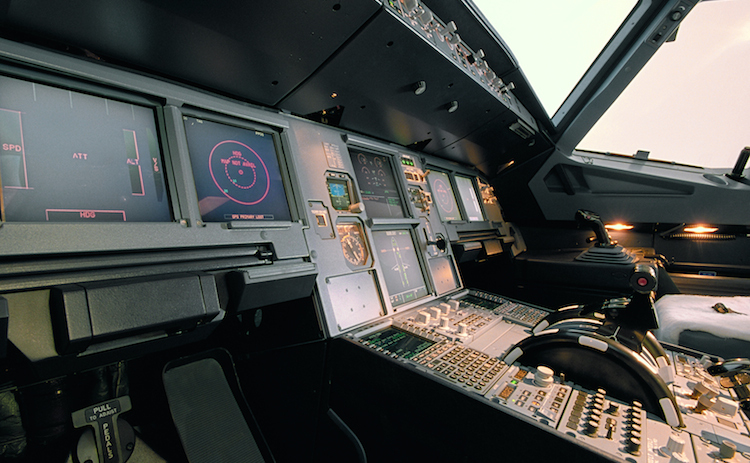 The two-person rule works like this – if a pilot has to leave the flightdeck to use the lavatory for example, a cabin crew member enters the flightdeck and while that pilot is away from the controls. Truss said the new arrangements would be reviewed after 12 months to determine their effectiveness. “As the investigation into the tragic loss of Germanwings flight 4U 9525 proceeds, Australian government aviation agencies will continue to work with the Australian aviation industry and airline staff to identify further improvements to the safety and security of aircraft cockpits as appropriate,” Truss said. Pilot and Australian Aviation contributor Owen Zupp wrote in a blog post on March 29 – before the government’s introduction of the two-person rule for Australia – he believed the change “may offer some degree of security if implemented correctly”. “The relieving crew member will need training and the appropriate level of expertise and not every flight attendant necessarily wishes to perform such a duty and bear the responsibility that accompanies the task,” Zupp wrote. “We must also bear in mind that these are potential safeguards against a relatively isolated event and down the road a different kind of isolated event will occur and a universal call for action will be heard again. “Unfortunately no human undertaking can be made 100 per cent safe and secure; we can merely endeavour to reduce the risk. To describe this as a knee jerk reaction would be an understatement! Sure, it is good for the peace of mind for the travelling public, but in reality it will do nothing to improve safety, and may in fact reduce it. Has the possibility of a malice flight attendant been considered? Or a flight attendant attempting to intervine when a pilot begins a sudden descent due to a TCAS RA? I know these are very unlikely examples, but so too are the odds of an Australian professional pilot intentionally crashing an airliner. Lol. Newspeak, much? He’s just described pretty much the *opposite* of what it is. Unfortunately, this does not address the underlying reason why the Germanwings crash occurred – mental health. Agree with Sean. I realise we live in a political world but facts are still important. This move will not increase the safety of the flying public at all. It is a token rule that resonates well with an uninformed public but in reality achieves nothing beyond increasing the logistical burden for airline crews surrounding flight deck access. If this was a real concern then where are the regulations surrounding train drivers going too fast and derailing trains? Why are military air transport and charter / private flights exempt? Are their pilots not susceptible to mental illness? and care of people in passengers aviation and general too. Well done Australia. Rodney. Home of QANTASVILLE II. Serbia. Really Sam? This kind of incident wasn’t the first time something like this happened. Look up the Silk Air Flight, for example. How many more hundreds have to die by a preventable cause before it no longer becomes ‘knee-jerk’ to you? Also, nobody is saying we should ignore mental health screenings, checks and whatever else. But two solutions are always better than one. There should always be a plan B. IN ADDITION, flight attendants already DO have permission to enter the cockpit if necessary, so it’s not like we’re introducing some new risk by this rule. What next? The 3-person cockpit rule. This is a bandaid to cover the bleeding nose caused by a brain tumour. It’ll make everyone feel better because ther is nothing unsightly but it won’t address the root cause. They should have 2 people there all the time in the cockpit in case one gets sick as well as for the above reasons. The bigger issue here for me is why couldn’t the other pilot get in. I know he had an override code but he still couldn’t get in and that shouldn’t happen. They shouldn’t be able to lock the other pilot out.. I agree with Sam. This is a joke. So a flight attendant stands guard over the pilot in control? It sounds more like a excuse to play a game of mile high Twister. Does the flight attended enter the cockpit before one of the pilots vacates or after? Pretty pointless doing it after the pilot leaves since the resident pilot could just slam the door just after he leaves but before the attendant enters. I’m not 100% on the space in the A320, but I know the SF340 cockpit is too tight for a 3rd person to enter and remain in the cockpit whilst one of the pilots vacate. It does far less for real-life risk reduction than it does for public perception, but that is important too. 30 years ago we were repairing aircraft that had NO fly-by-wire technology and laughing at the cockpit of the future cartoon which has a pilot and a dog, the pilots job is to feed the dog and the dogs job is to bite the pilot if he (or she) tries to touch anything… German wings will bring the pilotless aircraft age forward by about 10 years I think, removing human factors from the cockpit. We all know that if things continue as they are the skys will get busier and busier and automation is the answer. Despite his evil wishes, at some point, NO ONE will recall this murderers name like he so desperately wanted.. But we will all enjoy what is the response to his (or her) actions. For every evil deed, there is room for good things to happen, especially in aviation, the domain of dreamers! Useful contribution to security which brings Australia in line with established practice in the USA. The department’s justification for maintaining the status quo was EMPLOYEE BACKGROUND CHECKS and CCTV negated the potential for some one to bypass the security screening. @Lauren: The whole point of the post 9/11 cockpit doors was to keep people out of the cockpit at the direction of the pilots. The system worked perfectly. Germanwings is an awful, unfortunate demonstration of the law of unintended consequences. Adding more process by insisting on having a 2nd person in the cockpit at all times is a feel-good overreaction to an extremely rare event, and won’t mitigiate the risk: a determined pilot will always be able to bring an aircraft down regardless of how many people are in the cockpit, for instance during a critical flight phase like take-off or landing. The government changes are pointless, and might allay the fears of the uninformed public, but it will be as good as useless if another situation like Germanwings arises again. It amazes me that some people think this is actually a safety improvement. I am afraid this and the recent LAM 470 episode were aviation safety own-goals. The armoured ‘lockout’ cockpit door was a classic overreaction to something that did not happen. I cannot find any evidence (happy to be corrected) that the 9/11 the hijackers broke down the cockpit doors on any of the flights. There is no mention that CAM/CVR data provides evidence of the door being broken down or the locks being bypassed by some furtive means, so the door design was not a point of latent failure. The evidence indicates that people were coerced into opening the door-something that would be very unlikely to ever occur again. 9/11 was successful quite simply because it had not happened before. Up to that time hijackers wanted to go somewhere or get something, not kill themselves. The best course for everyone was to make concessions to preserve life and provide time to negotiate a successful outcome. Once passengers realised that sitting still and waiting to die was not a good option, survival instinct took over. Even on United 93 (the last 9/11 flight that crashed in Shanksville PA), this occurred. This survival / defence factor has been actively demonstrated at least twice since 9/11 when passengers have overpowered a ‘nutter’ acting in a threatening way. Yet rules were rushed into create a situation where the normal defence/redundancy of having two pilots had its Swiss cheese holes moved into alignment. This was such a predictable event that Swedish author and security expert Kristina Ohlsson wrote a novel describing an almost identical event in her 2012 novel ‘Hostage’. It is just mind-boggling that a ‘safety enhancement’ decision introduces a risk factor or removes a defence/redundancy deliberately on the basis of something that did not happen. The most basic risk assessment would have pointed out the problems with a lockout feature. Fear-based reactions have no place in aviation safety. This was a political and emotional mistake much like letting US pilots have guns in the cockpit. I wonder if they are re-thinking that one now. Whether we like it or not, humans are the most significant contributing factor in accidents and have been for many years. Notwithstanding that pilots are an active defence against unforeseen circumstances, the cold fact is that errors/actions/inactions by flight crew are many times (primary causal factor in more than 80% of accidents) more likely to kill us than any other factor. Knowing our own fallibility we must improve not degrade defences against crew actions of all kinds. The historical evidence, (Egypt Air 990, Silkair 185) of errant pilot behaviour should have long ago caused a rethink of deliberately introducing a risk factor like a ‘lockout’ feature in a cockpit door. Pilots are humans and as fallible as any of us. Perhaps Juan Trippe did us all a disfavour when he introduced the fantasy of the demi-God ‘Captain and First Officer’ that still influences the public and politicians today. Human Factors research tells us the unconformable truth of where the system weakness lies and all of us working in aviation need to do our best to see that we do not introduce weaknesses into the system based on emotional reactions. Finally, let’s not sugar-coat this. This was not a suicide. A suicide by definition involves one person taking their own life. This was mass murder by a sadly disturbed individual and our ‘system’ introduced the gap in defences that allowed him to do what he did. I go with Completeaerogeek regarding reinforced cockpit doors and the change in Hi-jack philosophy. Prior to 9/11 the advice was engage with the hi-jackers and just end up safely at another destination. After 9/11 it is now go down fighting. The cockpit door will always be opened for something, be it a toilet break, refreshments or to inspect another part of the aircraft. However I still think the second crew member is a useful contribution as we do not want a “nutter” left on their own in the cockpit. What has made aviation safe is the endeavour to plugging all the little holes in security and safety before the little holes join up and cause a disaster. This is without a doubt a knee jerk reaction. Consultation with the industry prior to implementation…nil. As an airline Captain the 2 in flight deck rule is a great idea but needs slight tweaking. 2 flight crew should be in the flight deck at all times, Which means for all RPT flights, you’d require a complement of 3 QUALIFIED flight crew. This business of having a cabin attendant to suffice the requirement Is ridiculous and unsafe for a number of reasons which the layman is unaware of. Our government has achieved success in creating a warm cosy feeling for the general public but has neglected safety in the process. If safety IS paramount, then dig deep into the federal budget to support airlines in making a change that has real effect by subsidising the 3rd crew member. It’ll improve safety, create jobs etc etc. This two person cockpit rule is becoming no more that super strict because that co-pilot who deliberately crashed a Germanwings A320 was a maniac, the cockpit door was locked and the pilot kept banging the door too many times and do you know what he said? OH FOR GOD’S SAKE, OPEN THE DOOR!! !